Accurate edging of sidewalks, driveways, walkways and bedded areas. Checking irrigation system for full water coverage and time regulations. Checking for bugs, pest, fungus, disease, ect. Trimming of palms, and trees. Fertilizing schedule for grass, shrubs, trees and palms. Pest control service to control bugs, pest, fungus, disease, ect. Planting shrubs, annuals, palms, and trees. -Don’t have a green thumb? Ask me how to get your landscape looking great! Service is also available for fellow landscapers! We are very impressed with Arthur Lawn Care and would recommend them to everyone. Very professional, always on time, and they do an excellent job. 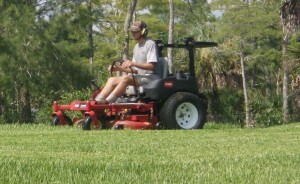 Allen does weekly lawn and shrub maintenance work and periodic plantings and mulching. Allen is a hands on thorough professional. He has great ideas and has greatly enhanced the attractiveness of our property. Great so far. Timely and thorough. We purchased our landscaping from Doria’s Landscape and planned out the whole yard in detail, we even had drawings made up. Before Arthur Lawn Care started to maintain the yard, it was in a state of disarray and wasn’t edged properly. Now it looks EXACTLY like the drawings, which is just what we wanted. They go up and beyond with customer service and are extremely knowledgable about all of the trees and shrubs in our yard. I would highly recommend them to anyone. Thanks guys! Great experience to deal with an owner Operator , Clean cut to the point no nonsense refreshing experience ! Always on time and a job well done. I had used half of a dozen different companies in a year’s time until I found Allen Arthur. I have kept him as my Lawn Service company for about 2 years now! He is very easy to communicate with and is very hands on, knowledgeable, and available in the event of a problem. This is the Lawn Service company to have. I am extremely happy with his company and services and I would describe myself and my wife as hard to please. If you are looking for an honest and reliable lawn and landscaping maintenance provider, Allen Arthur is your man! His pricing is very reasonable and he is extremely knowledgeable and dependable. I know I can count on him, even when I’m out of town. Call him. You won’t be disappointed! Kristin Shocklee Real Estate AgentEast NaplesDowning-Frye Realty, Inc.
We are very impressed with the open communication and quick turn over time for job requests. The owner demonstrates honesty and knowledge and has helped reinvent the landscape on our property. Definitely recommend Arthur Lawn Care to anyone looking for a reliable and forward thinking company.